The need for prayers for children’s ministry in the church and Christian schools is needed more than ever. Read through this list to be reminded of the great need for prayer. Do you take time to say prayers for children’s ministry in the church and Christian schools that are a part of your community and even of the world? Having been in children’s ministry for over 2 decades, I wish I could say that I have been tireless in my prayers to God asking for Him to work mightily in His church and schools. But I am ashamed to say that I grow weary at times and forget to pray. There are always many excuses that I can give. Yet, I want to be a person who prays with great passion and fervency for the churches and schools who proclaim Jesus to thousands of children every day. Today’s encouraging word is very much for me and I pray that it will be for you, too. I pray that this article will remind us all to pray more and pray prayers that are effective according to God’s will and purpose. Prayers for Children’s Ministry #1: Pray for the churches who have no children. Recently, I heard someone say, “The children are not the future of the church, they are the church.” I think this person meant that children should not be looked at as little people that we only invest our time of ministry in only for the future. We need to pour our gifts and talents into them now, knowing that it is in this present day that children are a vital part of every church. Prayer: Dear Jesus, please send a revival to all the churches around me and throughout the world who have little to no children running through their halls. Please move in the hearts of families to become a part of a church so that their children can grow in their relationship with You through the ministry of the church. Amen. Prayers for Children’s Ministry #2: Pray for Christian schools that are struggling to keep their doors open. Unfortunately, I hear this plea more than I’d like to. But the reality is, many schools have been closing their doors because of a lack of children to fill their classrooms. There are many Christian schools who have passionate hearts to give children a Christian education that includes a healthy dose of the gospel. We need to pray that God has mercy upon these schools who love Jesus and who love the kids that He loves. Prayer: Dear Jesus, please send a flood of children into the Christian schools who are willing and able to educate them according to your Word. Have mercy upon the schools who love you and are passionate about serving Your children. Help young parents see the need for training their children in Your ways and provide for them so that they can give their children a Christian education. Amen. Prayers for Children’s Ministry #3: Pray for the needs of each of the children you minister to. Prayer: Dear Jesus, I want to lift up (place child’s name here) to you. You know all that they are facing. You love them so much Jesus. You love them more than anyone ever will. Please let this child know your love. Let them know your comfort and provision. Keep them safe in your arms. And, Jesus, if there is anything you would like me to do beyond this prayer to help this child, please show me. Amen. Prayers for Children’s Ministry #4: Pray that children’s ministries will be willing to put the time and effort into their programs so that children are drawn to you. If you’ve been following me for a while, you know that I often preach the need for hard work in children’s ministry. Children’s Church should be a priority in your life if the Lord has called you to be a part of one. You must be willing to put in the hours needed to make your classroom a place where the kids want to return week after week. You must be willing to invest in resources that grow your ministry. And you must be willing to educate yourself in how to reach the kids God has placed within your care. Prayer: Dear Jesus, please give every children’s worker a deep passion for ministering to the children you have brought to them. Give them the energy and strength they need to do their very best every time they are given the opportunity to share Your love and truth. Amen. 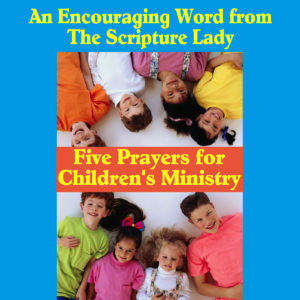 Prayers for Children’s Ministry #5: Pray for children’s ministers to effectively share the Word of God. The Word of God is life-changing when heard and applied to every life. May we, who work with children, be diligent in our study of God’s Word so that we may effectively share it appropriately for each age. Children’s ministry is not easy. In fact, some would say that a pastor of children has a more difficult job than a pastor of adults. Why? Because a pastor of children has to digest a truth from scripture and then make it edible for various age groups. This is a tall order, but an order that Jesus is waiting to help you with at a moment’s notice. Prayer: Dear Jesus, help all those who work with children know how to teach and share your truths. Help them take time to continue to grow in Your Word on a daily basis so that they themselves are nourished to feed Your little lambs. Amen. If you liked learning about prayers for children’s ministry, then sign up to receive Scripture Lady’s Free Email Kid Tips packed full with creative ideas and receive 12 FREE Bible downloadable resources to help get the kids you minister to excited about the Bible! Just go to www.MyFreeBibleGames.com to fully subscribe.